It seems more and more that there are popular teachers giving instruction on how to hear from God when we pray. If you’ve followed my blog for almost any period of time, you know that I feel this is a very dangerous practice and one that Christians should avoid. Lysa TerKeurst of Proverbs 31 Ministries is the latest proponent of this practice that has come to my attention. A friend and fellow servant of Christ wrote briefly about Lysa TerKeurst’s teaching on listening prayer. I wanted to share that with you (with his permission). Lysa TerKeurst of Proverbs 31 Ministries has a women’s study, What Happens When Women Say Yes to God. She teaches how to hear the voice of God and build personal, two-way conversations with God. 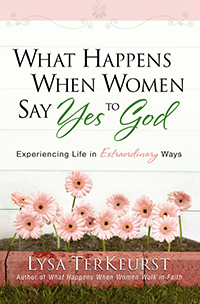 You can check out the video and her PDF document: How to Hear Gods Voice at: http://lysaterkeurst.com/what-happens-when-women-say-yes-to-god/. « Todd Bentley’s School of Revival?